The Australian Catholic Bishops Delegate for Youth, Bishop Anthony Fisher OP, has announced that Cosmos tour company will coordinate travel arrangements for an estimated 2,000 Australians making the pilgrimage to World Youth Day (WYD) 2016 in Krakow Poland. Having facilitated a six–month process of informing, identifying and selecting a company to support the Australian pilgrimage to WYD 2016, the Australian Bishops selected Cosmos as the company that will manage more than 30 groups. Cosmos has extensive experience in offering affordable tours across Europe and the world, and features a range of pilgrimage experiences. Cosmos, which caters for over 40,000 clients every year, is part of the Globus Family of Brands, one of Europe’s largest touring companies. It also has experience in pilgrimages and in Poland. “I am happy to announce the appointment of Cosmos as our Tour Operator for WYD 2016 in Krakow as it provides young people and the Church in Australia a great opportunity to prepare and visit the homeland of St Pope John Paul II and encounter Pope Francis through the WYD experience,” said Bishop Anthony. 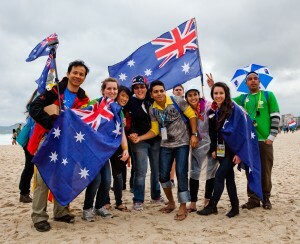 Enjoying the experience, World Youth Day pilgrims from Melbourne. Cosmos local offices are based in Sydney and headed by the Managing Director of Australasia, Mr Stewart Williams. “Cosmos, together with the entire Globus Family around the world, are very excited and humbled by this appointment,” said Mr Williams. Australia’s participation in WYDs is overseen by the ACBC Office for Youth, with each group coordinator developing and managing their particular needs. The Office for Youth has been working to establish a comprehensive planning guide and preparation plan for WYD 2016. These will be outlined at a National Briefing Day with Cosmos on Wednesday 13 August in Sydney. 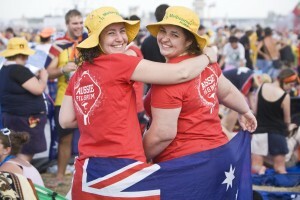 Pilgrimage Coordinators are asked to RSVP for the day via wyd@catholic.org.au. For Further information about this statement please contact Mr Malcolm Hart, Director, ACBC Office for Youth 0419 951 417. This entry was posted in Uncategorized on June 24, 2014 by Mark Wei.